While many people in Hollywood will be profiting from the movie "The League of Extraordinary Gentlemen," which will open in theaters next month, SHSU assistant professor Jess Nevins has already started profiting from it. The cover of Nevins' book "Heroes and Monsters: The Unofficial Guide to The League of Extraordinary Gentlemen"
Nevins, a librarian in the Newton Gresham Library, wrote a book about the original six-issue series comic book that was released in 1999. 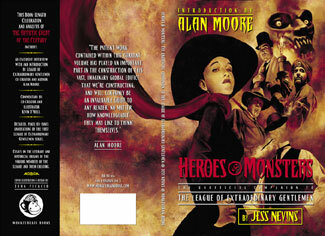 The book, "Heroes and Monsters: The Unofficial Guide to 'The League of Extraordinary Gentlemen," is a compilation of annotations, as well as three essays and an interview with the writer, regarding the Victorian and 19th Century literary allusions within the comic book. "On just about every page (of the comic book), in just about every panel, there is some sort of reference to something, and so I started annotating it because there's a lot of material in the comic book that would go unnoticed by people if they didn't really know Victorian literature and history," Nevins said. "The comic book has gotten a lot of favorable critical attention from respectable literary magazines and critics, and so my book is getting some of that favorable attention." Some of that attention has come by way of National Public Radio. "NPR decided to do a piece on the comic book and the movie, and they wanted to bring me into it to talk a little bit about the comic book," Nevins said. "Then they discovered that the studio was not helping with the movie, so I got more airtime-well I'm assuming I'm going to be getting more airtime-because they're not going to be talking much about the movie at all; so it will basically be about the comic book and my book." Though a definite broadcast time and day for the interview has not been set the interview will be aired either on "Morning Edition," the NPR morning news show, or "All Things Considered," the afternoon news show. NPR can be found on Houston radio stations KAMU 90.9 FM and KUHF 88.7 FM. "The piece will be archived on the NPR Web site (www.npr.org)," he said. "So people will be able to listen to it whenever they want." The comic book, as well as the movie, revolves around characters from different novels throughout that time period. "The premise of the comic book is that Mina Murray, the heroine of 'Dracula,' is hired by Mycroft Holmes, Sherlock Holmes' older, smarter brother, to bring together Allan Quartermain, who is the hero of a series of 19th Century novels written by H. Rider Haggard, Captain Nemo, Dr. Jekyll, and of course his alter ego, and the Invisible Man," Nevins said. "Mina Murray brings together all these characters to recover an antigravity element which appears in H.G. Wells' novel, "The First Men In The Moon," which has been stolen by Fu Manchu. "It's a fun premise," he said. "The comic book has dozens of sort of cameo appearances by characters from all sorts of Victorian writers, like Emile Zola and (Honoré de) Balzac, and there are all sorts of references to Victorian, 19th Century popular literature, culture and history." Soon after the comic book was released, Nevins began annotating the allusions, to which he devoted a Web site in 1999. "People kept sending me stuff, and eventually, when the publisher said, 'We want to make this as a book,' I started advertising on the Web site that this Web site will appear as a book," he said. "So people online have known about it for several months now." Though Nevins said he is pleased with all of the attention his book has generated, he is also a little embarrassed by it. "It's a little unnerving because I didn't expect it, but this is great. I thought the book would do OK but I didn't expect to be interviewed by NPR," he said. "I'm a little uncomfortable with the attention, but if it brings more people to read my book, then great. "I fell into it by pure dumb luck. I started this off as a hobby, as a diversion, but it's turned into a book that's selling pretty well, and I'm really happy about that," Nevins said. "It's helping me because I'm working on another book right now and I'm going to get some name recognition from that." Nevins' book, which went on sale at the beginning of June, can be purchased for $18.95 at www.amazon.com, on the publisher's (MonkeyBrain Books) Web site, www.monkeybrainbooks.com/Heroes_and_Monsters.html, or at Barnes and Noble Bookstores within the next month.